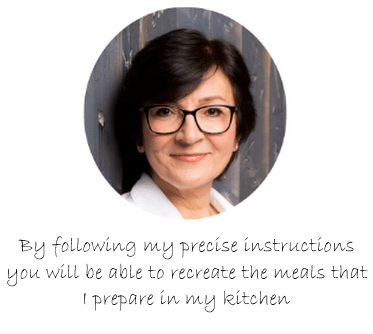 Today I am sharing my special Plum Crisp recipe with a crunchy and buttery toasted coconut, pecan and oat topping. 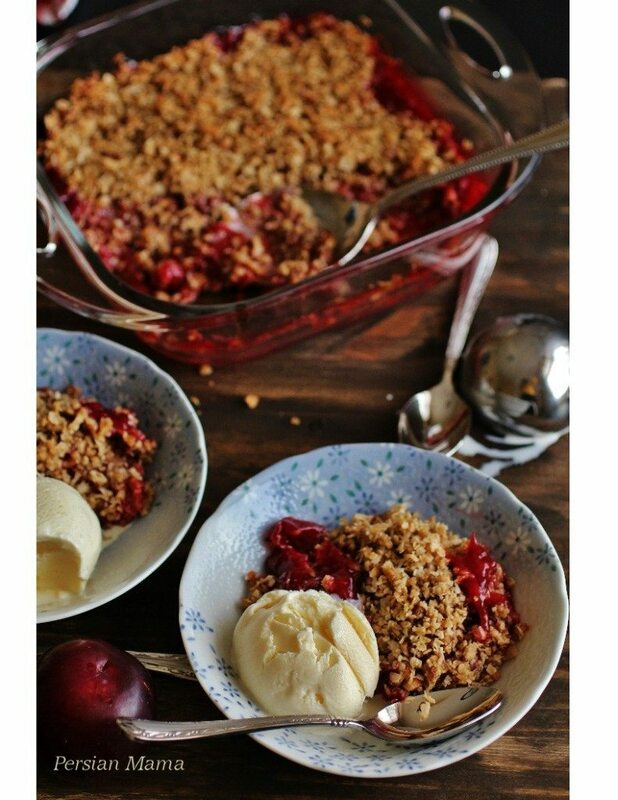 This recipe was inspired by a cobbler recipe that a friend of mine shared with me a few years ago, and I have used the plums from our backyard. We live very close to the mountains and just love it, but this close proximity brings unpredictable weather year round that includes very strong winds. We planted several fruit trees in our backyard when we moved here. Sometimes the winds were so hard on the poor young trees that I thought they would never make it. Luckily the trees have survived the harsh weather, and except for the cherries that we seem to have planted to provide nourishment for the flock of robins in our area, we have been getting a variety of delicious fruit every year, some years better than others. 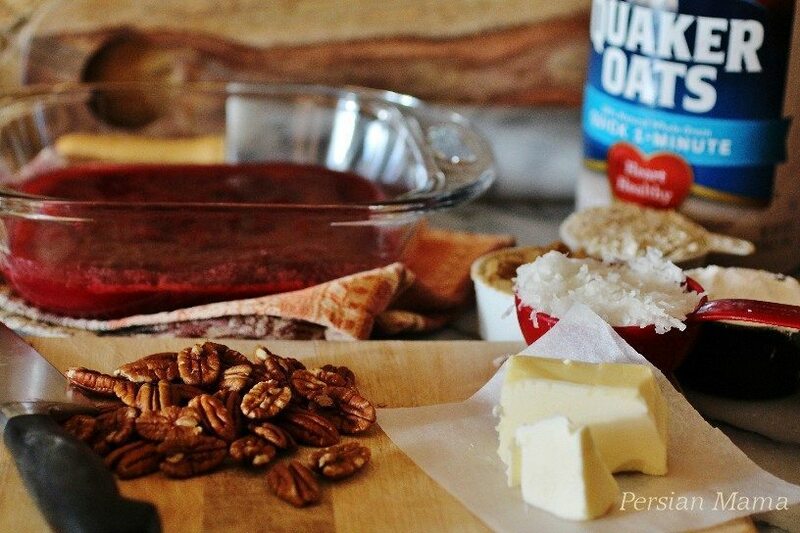 This is a very simple dessert that is delicious with a gorgeous red ruby color. 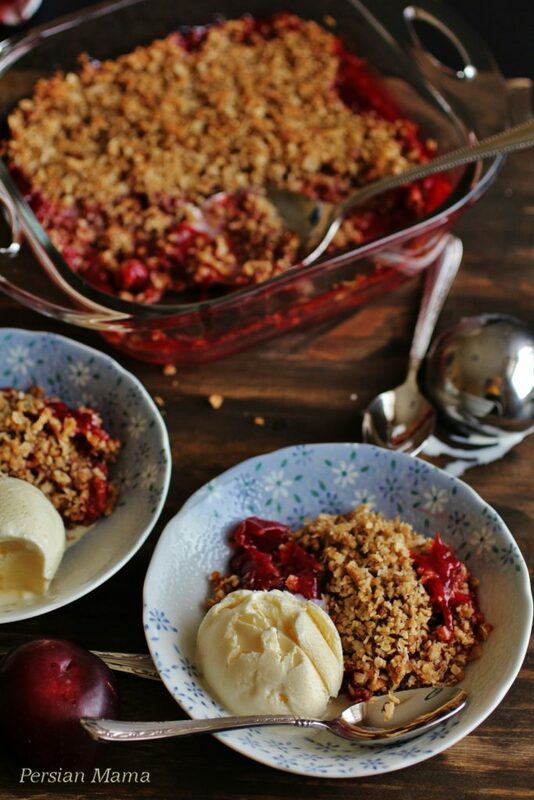 To begin making my Plum Crisp, I add sugar, 1 tablespoon fresh lemon juice and sliced pitted plums to a heavy bottomed 2-qt saucepan and give it a good stir. I let the mixture sit at room temperature for 30 minutes. During this time I stir the mixture a few more times. 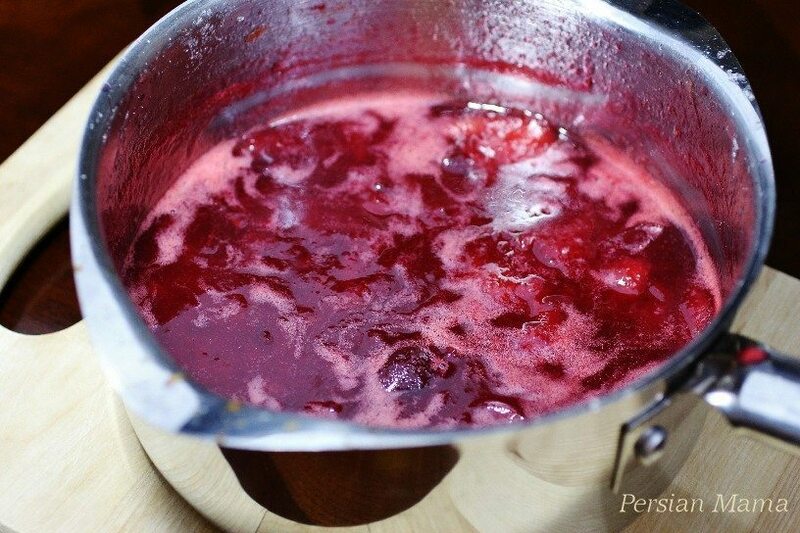 Gradually the juice from the plums and sugar form a natural syrup. I slow boil the sliced plums in the natural syrup. 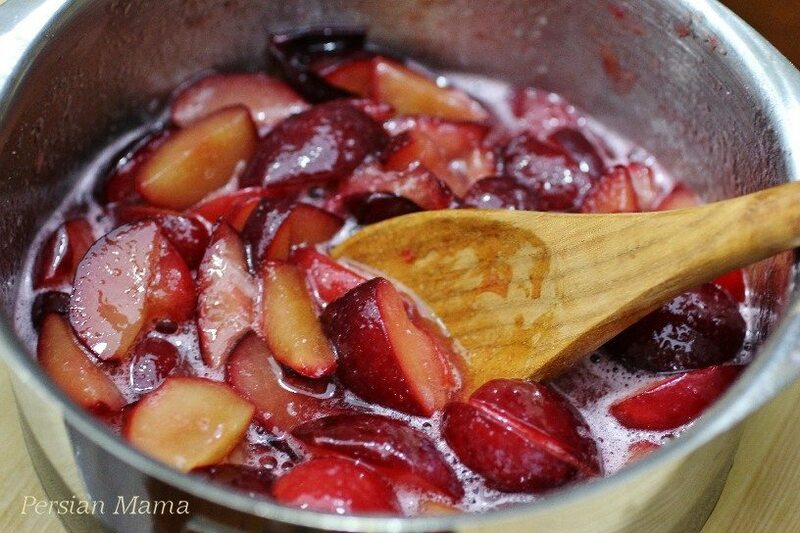 The sweet and fragrant aroma of the plums fills the room a few minutes into cooking. Let it slow boil for 20 minutes until the syrup thickens, stir it several times so it doesn’t burn. The syrup thickens without adding any extra agents. Add the topping and bake until golden brown and crunchy. And there you have it, a glorious ruby red plum with crunchy and buttery toasted coconut, pecan and oat topping. Cool the Plum Crisp on a rack for 20 minutes. 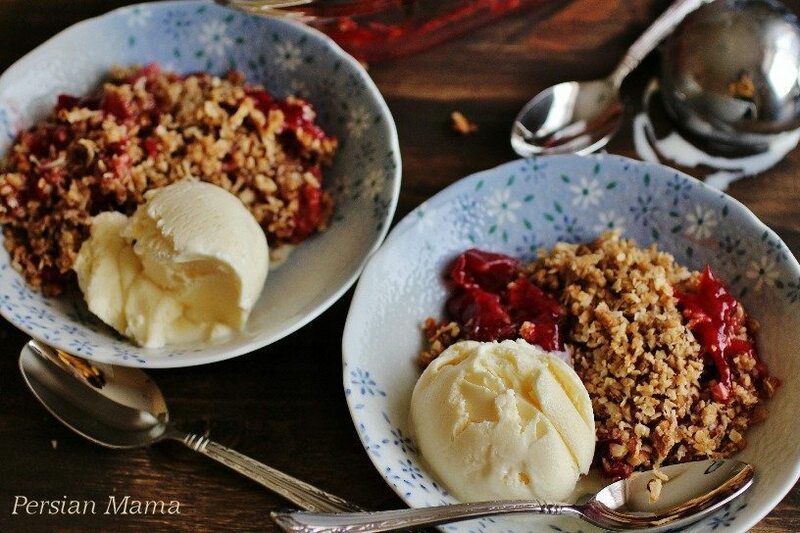 Serve the Plum Crisp with a scoop of vanilla ice cream and enjoy!! 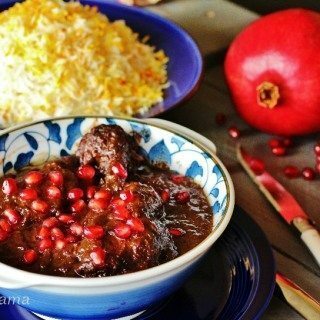 The fruit part of this crisp recipe can be cooked ahead, and needs to be chilled for at least 2 hours before adding the topping. Add the sliced plums, ¾ cup sugar, and 1 TBSP freshly squeezed lemon juice to a heavy bottomed 2-Qt saucepan and let it sit on the counter for 30 minutes until natural fruit syrup forms. Stir occasionally. Heat the plum and sugar mixture until it boils. Reduce the heat to medium and cook uncovered for 20 minutes, or until the syrup thickens and coats the back of a spoon. Stir occasionally so the syrup does not burn. Remove from heat. The syrup will thicken further as it cools. 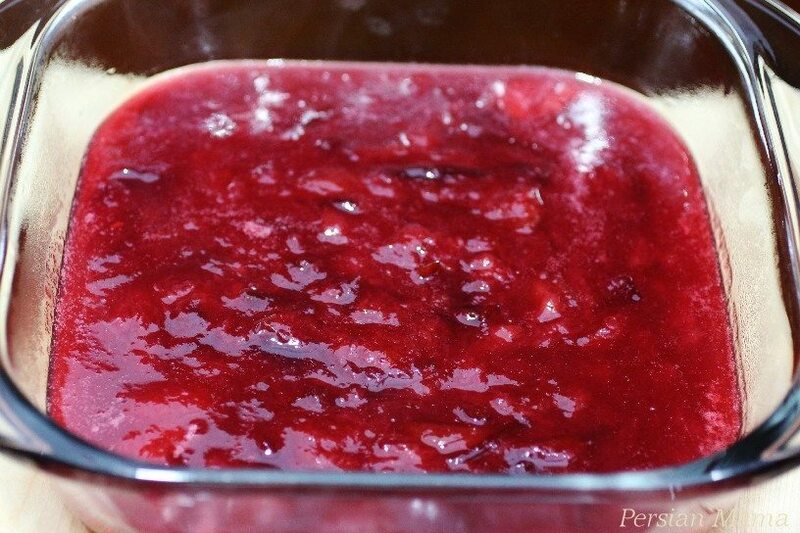 Transfer the plums to a heatproof 8x8x2 glass baking dish and chill uncovered for at least 2 hours in the refrigerator. 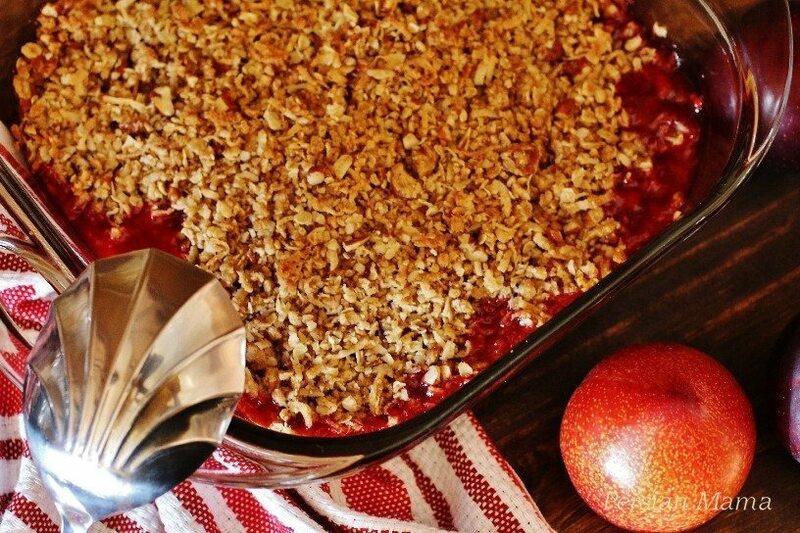 Bring the cooked plums to room temperature for 20-30 minutes before baking, so the glass dish does not crack when you place it in the hot oven. 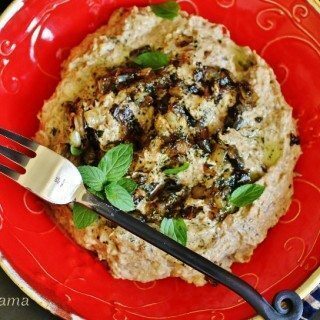 To prepare the crisp topping, in a medium bowl add the flour, brown sugar, oats, coconut flakes, salt, cinnamon powder and chopped pecans. Mix with a fork to blend. 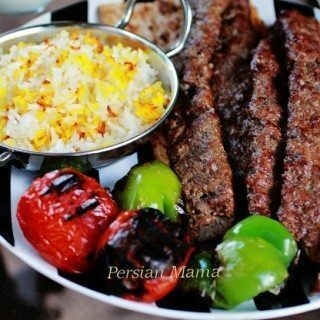 Add the melted butter and toss with the fork until the mixture resembles coarse meal. Sprinkle the topping over the plums and bake for 30 minutes until golden brown, and the fruit juices begin to bubble and surface on the sides. Remove from the oven and cool over rack for 20 minutes. 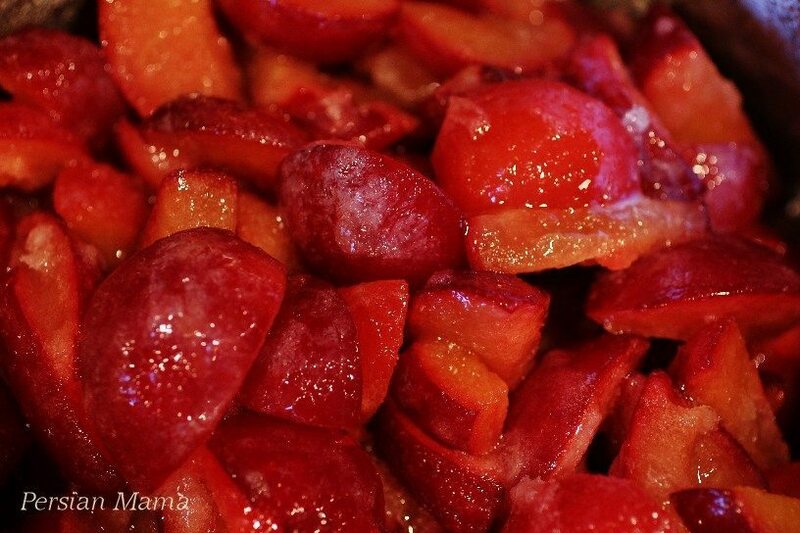 Sliced frozen plums may be substituted for the fresh plums. You do not need to thaw them. just add sugar and proceed with the directions for fresh plums. If there are pieces of ice stuck to the fruit, briefly run warm water over them to get rid of the surface ice before adding sugar. 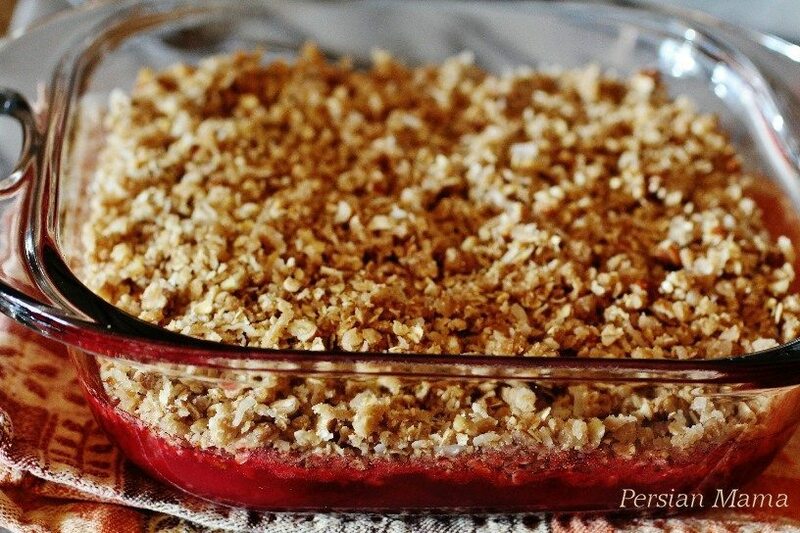 Delectable plum recipe perfect for this season with most succulent plums available. Yum!